The new Forestry Criteria of the Climate Bonds Standard has been formally launched today, marking a major turning point in best practice for low carbon and climate resilient investment in forestry industries. Necessary supporting infrastructure for each. An integral industry for many developed and developing countries, forestry-related investments form a substantial part of the capital assets in some countries. The UNFCCC has estimated that, globally, an additional USD14 billion in financial flows will be required to address climate impacts in agriculture, forestry, and fisheries in 2030, and specifically for forestry, UNEP estimates that USD17-33 billion per year is required to achieve a 50% reduction in deforestation by 2030. Our State of the Market Report 2018 analyses the green and climate aligned bond universe for sustainable land use (see page 29), including forestry. Overall, Land Use accounts for only USD37.3bn or 3% of the climate aligned universe, but there is strong indication that there is untapped potential for this to grow with the provision of Criteria. Climate Bonds has also identified Life on Land (SDG15) which includes sustainable forest management, as one of the six specific SDGs where increased green investment would provide a benefit, particularly in emerging economies. Targets 15.1, 15.2, 15A & 15B of SDG 15 are particularly relevant. The Forestry Criteria will assist in creating new capital flows into the sector with a new science-based framework that includes definitions and a screening mechanism for projects, assets, and activities against which both issuers and investors can assess green bonds. The qualifying projects and assets will be eligible for Climate Bonds Certification. Bonds seeking Certification must also meet the reporting and transparency requirements of the overarching Climate Bonds Standard. Climate Bonds Certification allows issuers to demonstrate to the market that their bond meets industry best practice for climate change mitigation and resilience, as well as for management of proceeds and transparency. Forestry has not yet become a significant share of the green bond market, and while best practice standards do exist in the sector, they do not necessarily focus on strong climate measures. Certification indicates to investors that proper climate due diligence has been carried out on the assets that they are investing in – a robust and credible way for this new asset type to enter the green bond market. Development of the Forestry Criteria began in 2014 with the convening of an Agriculture, Forestry and Other Land Use (AFOLU) TWG to work on the Land Use Criteria. The development of the Land Use Criteria set principles that were then refined into specific Forestry Criteria. A Forestry TWG was then convened on the basis of the work done by Land Use TWG. A second group, the Industry Working Group (IWG), was responsible for checking the Forestry Criteria are practical for use. Across the two groups there was representation from leaders and subject matter experts drawn from academia, NGOs, issuers, investors and verifiers. The Criteria underwent public consultation in June 2018. Climate Bonds extends its thanks to the dedicated TWG and IWG members for their instrumental role in developing the Criteria. 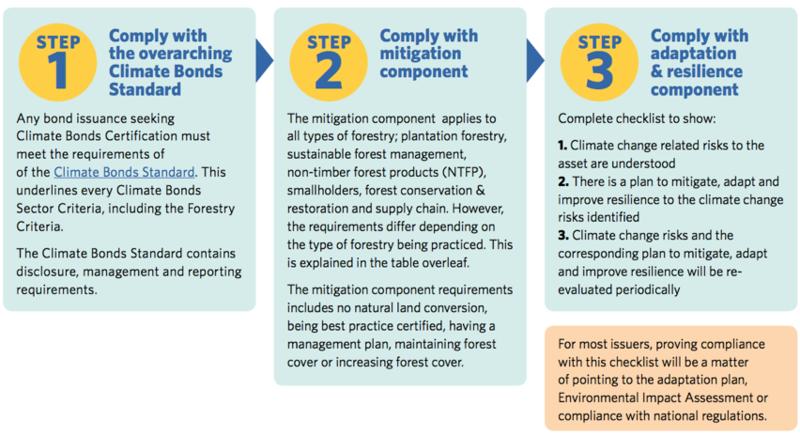 "The CBI Forestry Criteria can help to ensure that forestry infrastructure assets or projects meet a certain standard for climate-friendly investment. People should be able to live equitably and sustainably in and alongside thriving forests and healthy, resilient landscapes." "Involvement of the private sector and government is imperative and good governance is the bedrock for the development and implementation of ‘community friendly’ national forest policies, programmes, and regulatory frameworks." “A swift transition towards a green economy and bio-based production is needed and providing this, CBI standard for investment in such a crucial natural resource as forests, is a step in the right direction." Definitions and disclosure mechanisms have been an emerging issue in the field of green finance as market growth has accelerated during 2016-2017. Climate Bonds has been expanding the scope of its sector based Criteria throughout 2018 and will continue this program next year, providing issuers and investors with the additional investment assurance around climate credentials of green bonds in additional industry sectors. Keep an eye out for announcements including the release of Bioenergy, Protected Agriculture and Hydropower Criteria in the coming months. The new Climate Bonds Standard Version 3.0 is also on the way, so stay tuned!